Throughout the second week of March, members of SSI and the “Waste Watchers” sought out to catch students at OSU on their best ‘green’ behavior. Those that were seen recycling, composting, reusing, or performing other healthy environmental activities were rewarded with a variety of prizes. 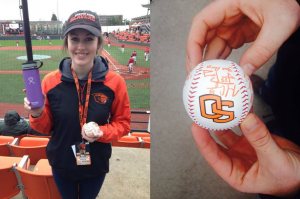 This promotion of being “green” was held throughout all last week covering highly populated areas on campus, as well as an OSU baseball game and men’s basketball game in which autographed memorabilia was presented.